Guess one: The Year of the Pig is getting off the door? 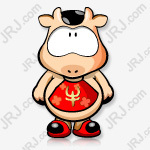 Specific reasons: The end of the Spring Festival holiday, A shares entered the year of the pig trade. Looking forward to the first trading day and the first week, the analysis pointed out that although the pre-holiday market suffered from the “detonation” of listed companies, the Shanghai stock index gained 5 consecutive days due to the sharp rise in the last trading day; During the holiday season, the A-share pig year is expected to open. In the opinion of analysts, with the past period of the performance period of the poor performance forecast, the A-share market entered the most operational period of the year.Tianfeng SecuritiesThe strategy team believes that after the impact of the annual report forecast, the market will gradually repair and adjust the performance expectations for the first quarter of 2019. In fact, since the beginning of 2019, the market has shown signs of recovery. In January 2019, the Shanghai Composite Index gained 3.64%. In the 10 trading days before the holiday, the Shanghai Composite Index fluctuated around 2,600 points, with an overall increase of 0.86%. The last trading day before the holiday was especially strong. The Shanghai Composite Index closed up 1.30% and hit 2600 points. The agency believes that after entering February, the market will usher in a “spring stir”.Guosen SecuritiesIt is pointed out that “spring sway” refers to the staged rising market in which the stock market generally has a high probability from January to March, which is essentially a kind of calendar effect. Generally speaking, at least one month in the first three months of the first quarter is rising, and the probability of rising in February is the largest. 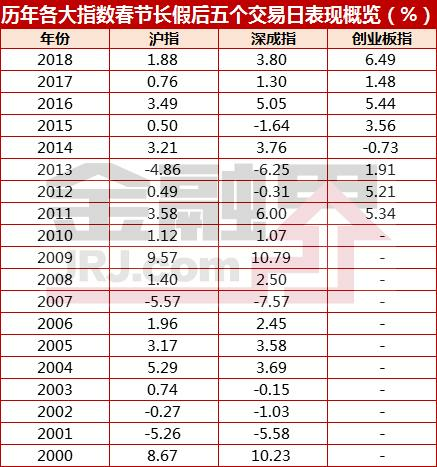 It is worth mentioning that according to Wind information statistics, from the 2000 to 2018, during the 19 years after the Spring Festival, the Shanghai stock index rose 78.94%, with an average increase of 1.57%. Coping strategies: Analytical recommendations are more focused on less-moving, focusing on growth or performance-supporting oversold stocks, military and state-owned enterprise reforms on the subject. Guess 2: Small and medium-sized performance is even better? Specific reasons: On the last trading day before the holiday, the SME board and the GEM index all rose by more than 3%. Brokerage analysts said that since the 2015 high point, the SME Composite Index and the ChiNext KLCI have both been “waisted”. Small and medium-sized companies have been criticized for their high valuations, and there are many stocks that have entered the attractive range and whose value is undervalued. Huatai SecuritiesAccording to the research data, since 2009, the CSI 500, CSI 1000, SME board and GEM have been significantly higher than the pre-holiday. Researcher Huatai Securities pointed out that the reason for this situation may be that investors' strategies are more conservative before the Spring Festival. After the holidays, the investment strategy becomes more positive, and tends to shift positions to more flexible small and medium-sized enterprises. “In the past year, many small and medium-sized Chuangyi stocks have been ignored or even killed. The market outlook is expected to become the focus of the main fund layout.” Market participants pointed out that it is in line with the direction of industrial upgrading and policy support, and the economy can continue to rise. The economic concept, especially the leading stocks among them, is the most certain investment line in the future A-share market. Everbright SecuritiesAccording to the research report, in the fourth stage of “weak data and loose policy”, small and medium-sized enterprises are expected to become a sector with a larger valuation, and small and medium-sized enterprises will be damaged before the new round of cycles after the interest rate is fully declining. Earlier, the adjustment will be earlier, but at this stage, due to financial cost savings, improved total demand and other reasons, the first profit rebound. Coping strategies: The analysis suggests focusing on small and medium-sized stocks that have large declines, performance support, and good growth. Guess three: oversold low-priced stocks active? Specific reasons: Since the fourth quarter of last year, stocks dominated by oversold low-priced stocks have continued. According to the analysis, in order to improve the liquidity pattern of the A-share market, relevant parties have introduced a series of measures, including regulatory optimization, window guidance measures, and relaxation of asset restructuring policies, which are mergers and acquisitions of low-priced stocks and low-value products. Provided an opportunity. In this context, the concept of oversold low-priced stocks will continue to be the main force leading the main city. "Some stocks may have an objective reason for oversold, but from another perspective, with the upward shift of the A-share valuation center and the shocks in the rebound background, it is a bright spot to rise less or not. After the factors that restrict the stock price rise are eliminated, the oversold stocks may usher in a wave of rebounding market.” According to market veterans, from the perspective of risk-return, the marginal risk is gradually reduced after the continuous decline. The marginal revenues began to increase, so the next step can be focused on the rebound of oversold stocks. The number of oversold stocks is large and the variety is mixed. So how do you choose? Market participants said that there are two types of stocks that are oversold or stagflation. One is the oversold caused by changes in the basic factors of individual stocks, such as the poor completion of corporate profits; the other is technical oversold, that is, the broader market declines. When it falls, it falls deeper and faster. In terms of layout, the first stock can only make a short-term technical rebound, while the second stock can look at the company's basic factors and hold it for a relatively long time. Coping strategies: Senior analysts suggest to explore the following three types of stocks, one is the small and medium-sized board and the GEM stocks that have a better development prospects and have certain performance support. Second, some second-tier blue-chip stocks with low prices and relatively low valuations. The third is related stocks that are active in the history.